I arrange tours of the Dark Sky Park of Møn & Nyord, for those interested in experiencing the special darkness we enjoy here. It is very exciting to experience the wonders of the night sky on clear nights in our internationally renowned Dark Sky Park. We can look at the stars using our naked eyes, we can use special binoculars, a small telescope, or a larger telescope. Depending on what is on display at any given time, we can look at the Milky Way, star clusters, planets, nebulae or galaxies. All things that are almost impossible to see from a city, because of the ever increasing light pollution there. I also teach courses in astrophotography, and we can make photos of the Milky Way, or selected smaller objects of the night sky. 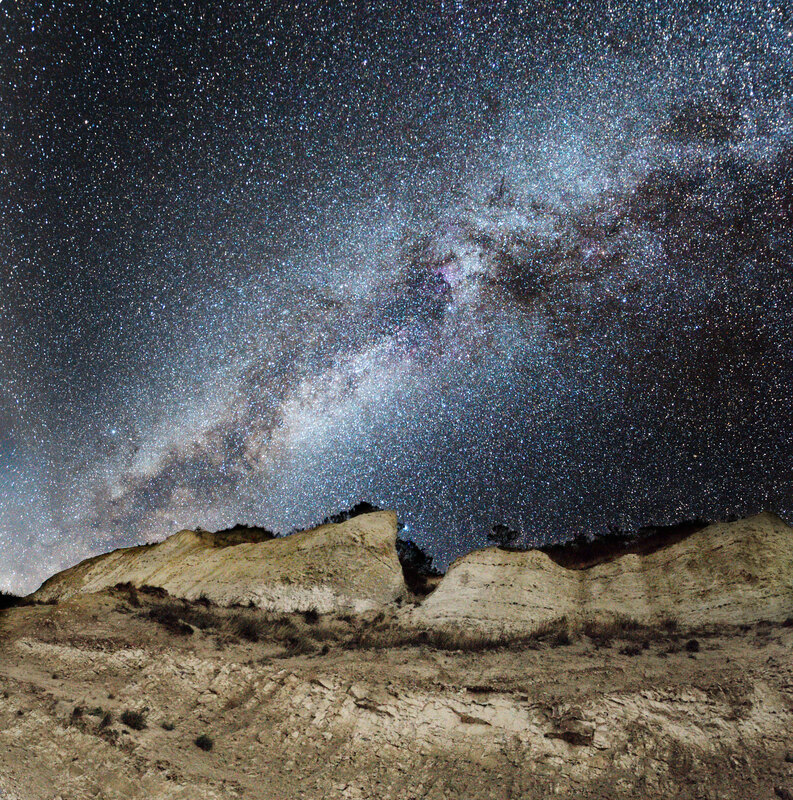 If you like, we can include you in a milky way photo, too. Whatever your interest, I will contribute with my knowledge of what's going on in the sky. I can also arrange walks in the forests and meadows, to experience the special feeling of being in a really dark place. The augmentation of the other senses, hearing the sounds animals make at night, and just be at peace without the constant light of the city. On clear nights, we can navigate using the stars instead of a compass. Please contact me if you are interested in a tour, let me know what interests you, and we we can arrange for a trip into the darkness of Møn at night. 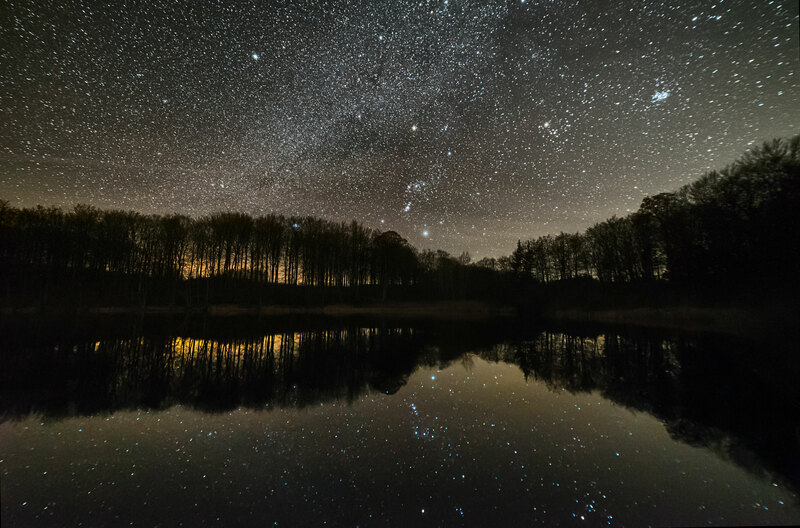 With no wind, the stars are reflected in the small lake. 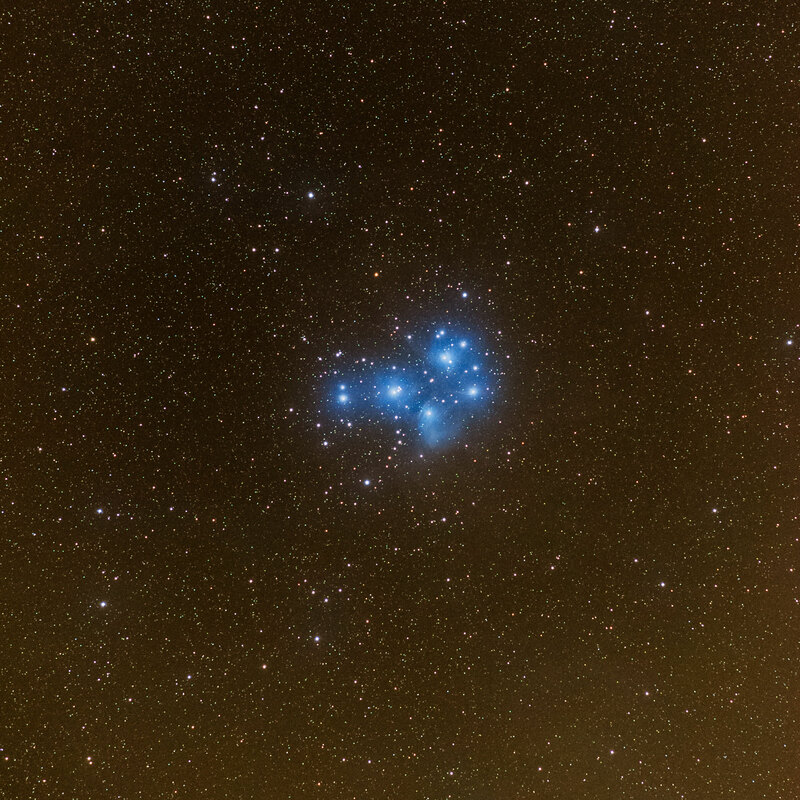 Orion is located at the centre of the image, and the open cluster Pleiades is at the right. 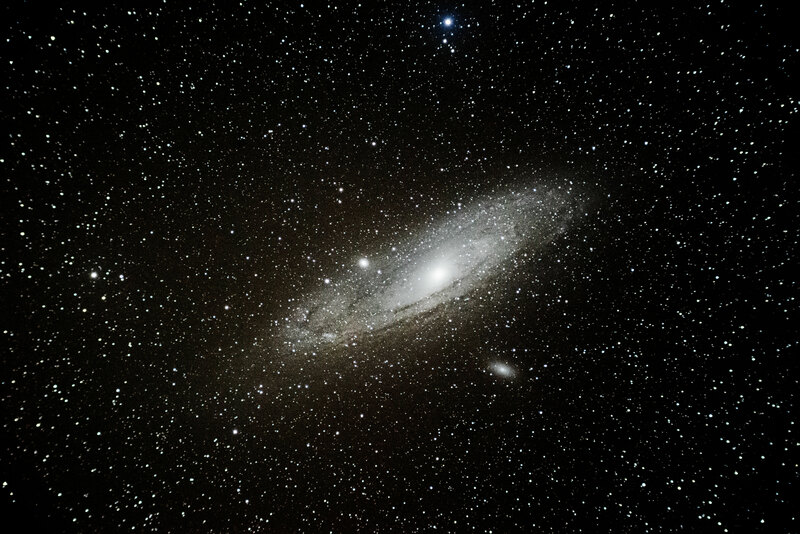 The Andromeda galaxy is our neighbour galaxy, about 2.5 million light years away. 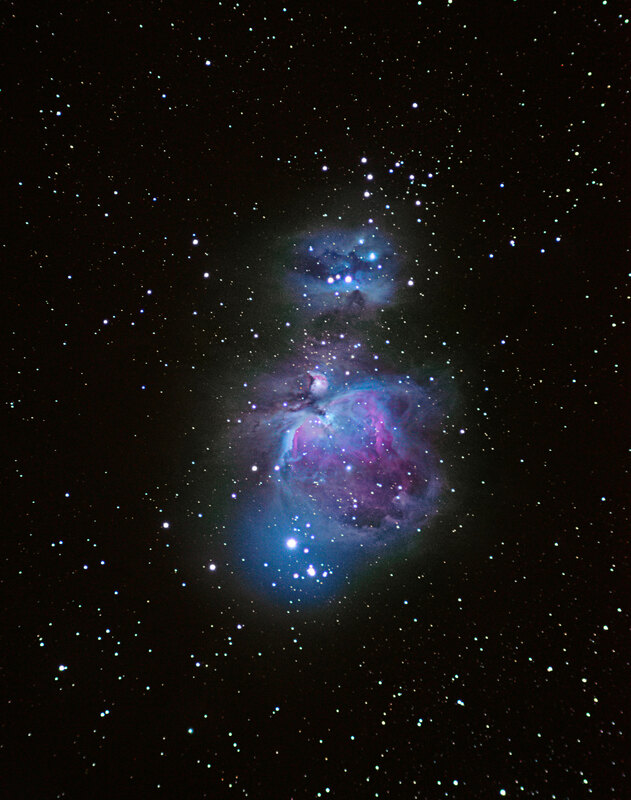 Orion's Sword consists of several nebulous regions. Only the central part is visible to the naked eye, but whith a telescope the larger parts are visible. The colours are only visible in photos. This photo is from Jydelejet, at the edge of the forest near the famous chalk cliffs of Møn. Pleiades is an open cluster of bright new stars. Their strong radiation makes the dust around them glow. The stars are clearly visible to the naked eye. The full moon lights up the landscape, making it almost look like day time. But the stars in the sky make it clear that this is a night time photo. 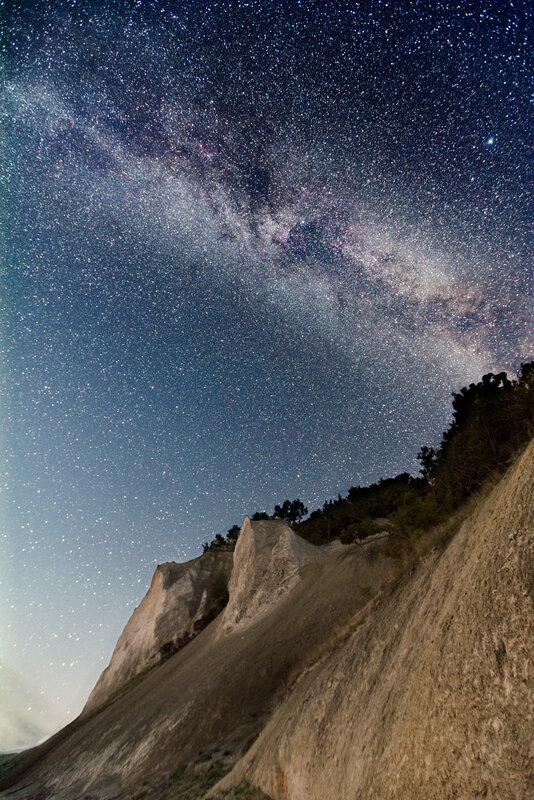 From the beach at Møns Klint the Milky Way is clearly visible. 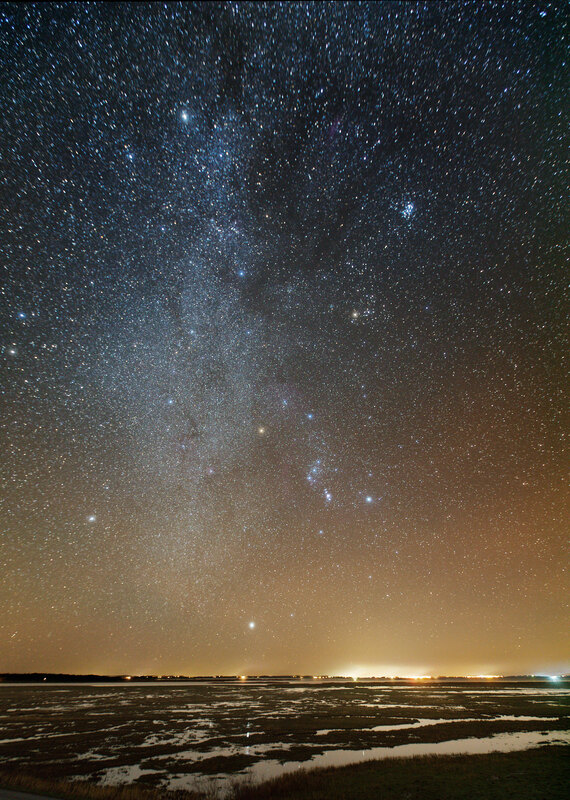 Nyord is a part of Dark Sky Park Møn. Møn and Nyord are two islands in the Zealand Region of southeastern Denmark comprising 223 km2 (86 square miles) of land area. The much-larger island of Møn makes up the bulk of this area and is one of the most popular tourist destinations in Denmark. Famous for its white chalk cliffs, Møn offers visitors a slower pace of life compared to the bigger cities of Europe, complete with open countryside, sandy Baltic Sea beaches, and shopping in the market town of Stege. 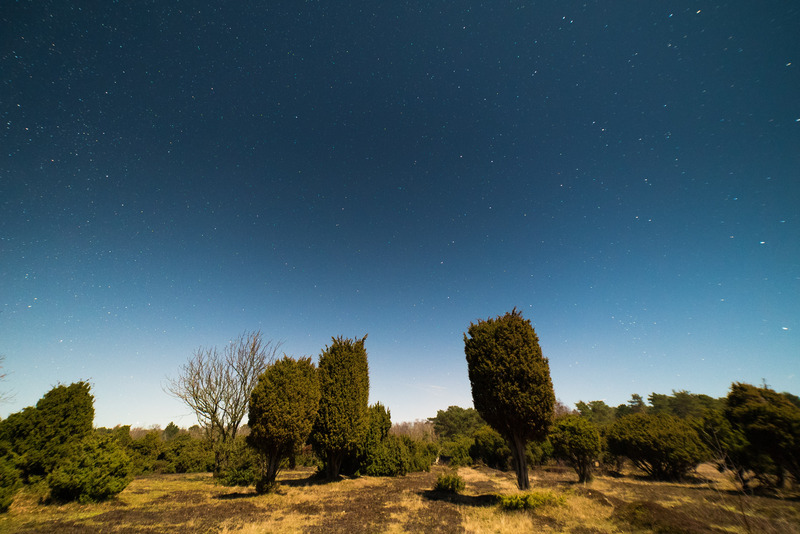 In 2014, residents of Møn began an effort to promote the Islands’ dark skies as a means of economic development and tourism potential, culminating in a joint effort for IDA recognition as both an International Dark Sky Community and an International Dark Sky Park. The reasoning for this approach is that it results in better protection of current nighttime conditions in both the developed and wilderness areas of both islands. You can enquire about a trip, and we can discuss which activities you are interested in. Submitting this request does not constitute a binding agreement for any of us.